This is the first article in my Recess Framework blog tutorial. This tutorial will introduce you to the Recess Framework, a RESTful and open source PHP framework sponsored by New Media Campaigns. You will also learn how to create a fully functional blog with comments, categories, and authors. If you see a Congratulations, Recess is almost setup! message, the Recess Framework has been installed successfully. If you do not see this message, be sure you include index.php at the end of the URL in your web browser. If you still do not see this message, review the installation documentation on the Recess Framework website. From this point forward, the path to the filesystem directory created for this blog will be called the [BLOG_ROOT]; the base URL with which you view this blog in your web browser will be called the [BLOG_URL]. On my machine, the [BLOG_URL] is http://localhost/~joshlockhart/recess/ and the [BLOG_ROOT] is ~/Sites/recess/. These paths will be different if you use Windows or Linux. 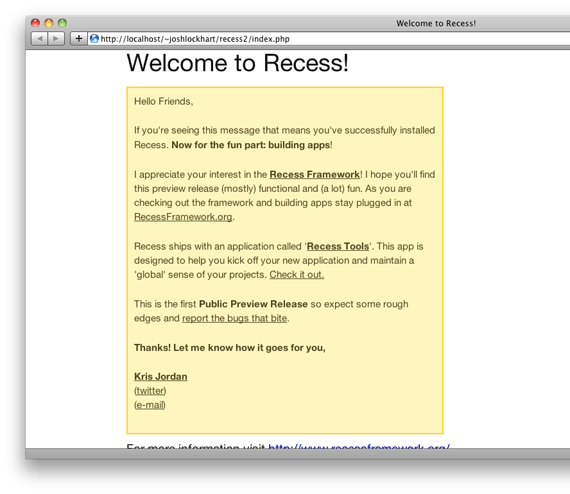 If you refresh your web browser (still viewing [BLOG_URL]index.php) you will see a Welcome to Recess! message. If you do not see this message, be sure you append index.php to the URL. The SQLite database file will be created for us at [BLOG_ROOT]data/sqlite/default.db. Make sure this database file is writeable by the web server, too. Finally, run these SQL commands in the SQLite database. These commands create the blog schema and load sample data. If you are unfamiliar with sqlite on the command line, you can download the Firefox SQLite manager extension that provides an easy-to-use GUI inteface. The initial blog. 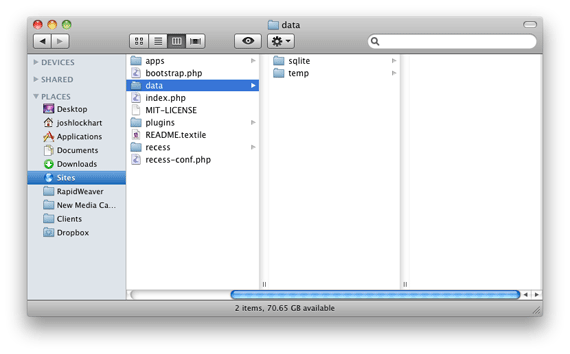 prefix represents the [BLOG_ROOT]apps/blog/ directory. 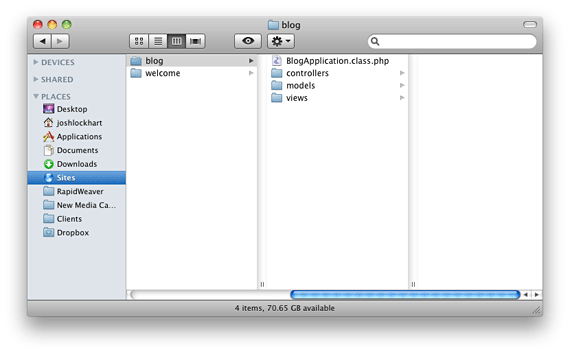 The BlogApplication suffix represents the BlogApplication.class.php file we created earlier. Recess uses declarative annotations to attach metadata to models, controllers, and controller methods (similar to PHPDoc annotations, but prefixed with ! instead of @). In the Post model above, we use a Recess annotation to declare the database table used by the Post model. Let’s walk through the code line by line. First we instantiate a new Post object. Next we call $post->all() to retrieve an array of Post records from the database. We store this array in a public class variable, $this->posts. All public class variables in the controller are automatically passed into the view template which we will create next. We also attach a Recess annotation to the PostsController::listPosts() action. This Recess annotation declares the routing information for this action: we can access this action with a GET request to [BLOG_URL]index.php/blog/posts/. We can view the PostsController::listPosts() controller action in a web browser at [BLOG_URL]index.php/blog/posts/. If you view this action in a web browser, you will receive an error because we have not yet created our view template. Let’s do that now. In your web browser, view [BLOG_URL]index.php/blog/posts/. You should see a list of posts. Our view markup loops over the $posts variable (passed from the controller). Columns from the posts database table are available as object methods. You may notice that we did not set the href attribute of the post title link (we will do this next). First, we need to create a new controller method to display a single blog post. Let’s do that now. This method uses a Dynamic Route which passes the $id route parameter into the PostsController::show() action. 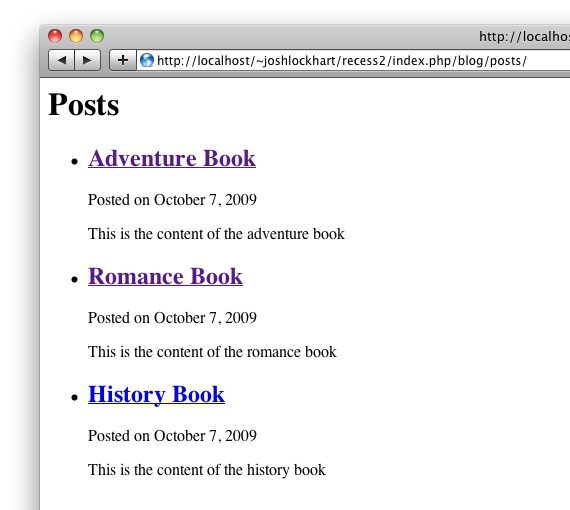 If we access [BLOG_URL]index.php/blog/posts/1, the PostsController::show() action’s first parameter will be equal to 1. We then set a public class variable — $this->post — equal to the first Post whose ID is equal to $id. The $this->post variable will be passed into the view template. We are using the Url helper available in our view template. The first parameter of the Url::action() method is a Controller::method pair, or the destination of our hyperlink. The second parameter is the ID of the current Post. The Url::action() helper method creates a URL to the PostsController::show() controller action using the current Post’s ID. View [BLOG_URL]index.php/blog/posts/ in a web browser. You can now click on a post’s title to view the post’s individual page. In this article we learned how to install and configure the Recess Framework, how to create a modular Recess application, how to create a model that interacts with a database table, how to create a controller, and how to create a view template. We now have a basic blog that displays a list of posts with links to each post’s individual page. The next article of this series will demonstrate how to create posts, update posts, and delete posts using the Recess Framework ORM. Stay tuned! How-to MANUALLY create a blog with the Recess PHP Framework.